Driving down Baja this season? Be sure to see all the updates with close up maps and places to stay. Use the Driving Down link. miles means huge rolling swell. On days when it does not blow the kayaking, dirt biking, mountain biking, fishing, hiking, ATVing are world class. Whether you are just dreaming about winter sailing or kiting, planning your first trip or preparing for your annual winter migration you will find the Baja Guide links at the top of the page useful. After over 43 exploring, diving and windsurfing trips ranging from San Carlos to Cabo Pulmo and a total of over 4 years spent in Baja I still have lots to learn. 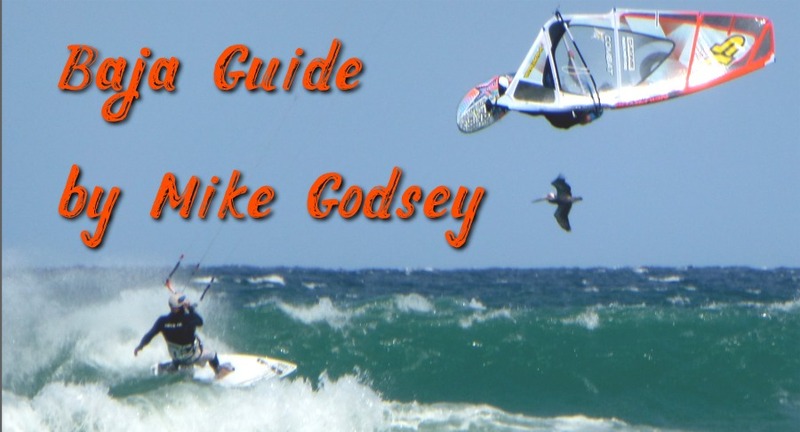 Contact me at mike@iwindsurf.com for suggestions or additional information. Have fun exploring this guide and Baja! Live video feed of traffic at Tijuana border crossing. Current wait times at all Baja border crossing. If this is your first drive to Baja check out the updated Baja Travelogue link and learn about the driving traditions of Baja in the Baja Driving hints link. Thinking about buying land or building a house in La Ventana? I have been watching different mMexicancontractors and gringo “supervisors” build houses for over 12 years in this area. There are several good ones but many poor ones. Contact me at mike@iwindsurf.com.. The new El Chaparral border crossing into Tijuana opened Thursday Nov. 1 2012 and the old border crossing is closed. DO NO USE a older GPS UNTIL YOU ARE 5 MILES PAST THE BORDER. IT WILL BE INACCURATE DUE TO NEW ROADS. At the bottom of the page is a map showing how to get to the new border crossing. If you follow the map you will find it much easier than the old crossing to get your visa and to pay your bank fee at the inspection area. The Secretary of Tourism office in Tijuana reports that the Migracion office and the bank are both open 24 hours/day. See the map and description at the bottom of this page. 5. Entering the building and you will find the “inmigracion” office. Present your paperwork here and fill out the FMM. 6. Head west about 50 feet inside the building and you will find the “Banco”. Pay $24.50 USD or Peso equivalent. 7. Return to “inmigracion” office and have your FMM stamped. 8. Return to your car and exit looking for the sign saying “A Playas De Tijuana, Rosarito Y Ensenada. 4. Walk down a long wide hallway then turn left to the “inmigracion” office. If you have not crossed the border since Nov. 1, 2012 be aware that the Tijuana Border Crossing has been replaced. Return to the “Inmigración” to get your form stamped. Leaving the crossing take the “A Palyas de Tijuana, Rosarito Y Ensenada turn off over the dry river bed. This will merge with the old route running parallel to the border and on to Hwy 1D toll road to Ensenada. Border crime involving tourists has continued to dramatically decline in the Tijuana area. 2012 and so far in 2013 there have been no reports on any issues. Coming back to the USA by way of Tijuana is more problematic since it is easy to miss the turnoff to San Diego or it may be full forcing you to wander about the streets of Tijuana trying to find the Otay border crossing. I strongly recommend you take leave Hwy. 1 just north of Ensenada and cross the border at Tecate. Yes, it is a longer drive but you will actually save time since you will have a much shorter wait at the border. The route is very scenic and you avoid the whole Tijuana scene. To put this in perspective the most recent statistics shows Mexico has a current rate of 1200 violent crimes per 100,000 residents. The USA as a whole has a violent crime rate of 467 per 100,000 so overall Mexico is a more violent country. But violence in Mexico is like the USA in that certain cities and neighborhoods harbor most of the violent criminals. To put this in perspective: Washington, D.C.’s 2007 violent crime rate was 1,413. This is even higher than Mexico yet no one is suggesting that people not visit the nations capital. Since most of you will be passing on the highway on the outskirts of Tijuana let’s focus on that violence-ridden city. In 2007 Tijuana’s murder rate was 17.5 murders per 100,000 people. Pretty scary but Tijuana had a significantly lower murder rate than Las Vegas, Houston, Dallas while New Orleans had a murder rate 300% higher than Tijuana. But the bottom line is that violence is scary especially when you are in a foreign country and don’t speak the language. Personally, you could not pay me to drive around the streets of Tijuana these days especially at night or pre-dawn. But then again I have same feelings about parts of Los Angeles. So follow the guidelines below and look at the map at the bottom of the page very carefully so you don’t get an undesired tour to unsavory parts of Tijuana. Remember thousands of old folks in their late 60’s and 70’s drive down this road every year in monstrous RVs. If they can handle it so can you. Just use some common sense. “From your tip about the bad road sign to the turn off for the San Diego border crossing in Tijuana near the border I was very careful and drove slowly. I even asked for some directions from the last toll both. They just said it was very easy and did not offer more than that. I caught all the road signs and made the right turns until I got to the last split in the road before US customs. I could not tell which way to go. I stopped and searched for a clue. Traffic was not bad there. That was my big mistake. of Nov. 1, 2012 there is an new Border Crossing at the Tijuana border. ‹ Nocturnal breeze touches down briefly into Boston Harbor.